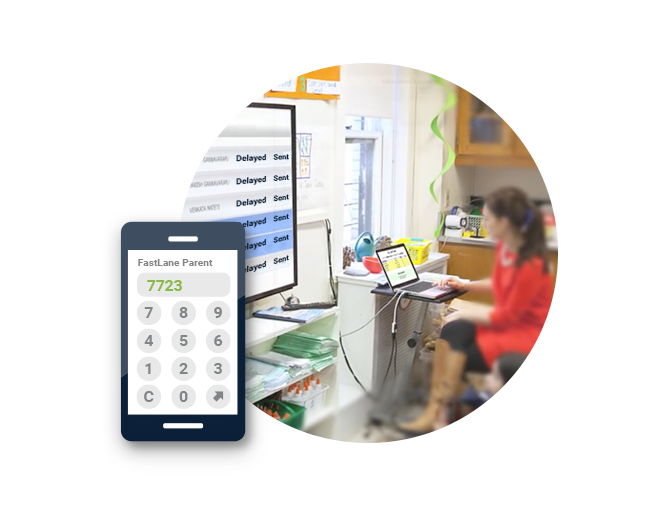 Imagine your school office without the phone ringing constantly. Imagine the end of the school day without the PA system in overdrive. Imagine your car line flowing smoothly. With School Dismissal Manager the school you imagine can start today. 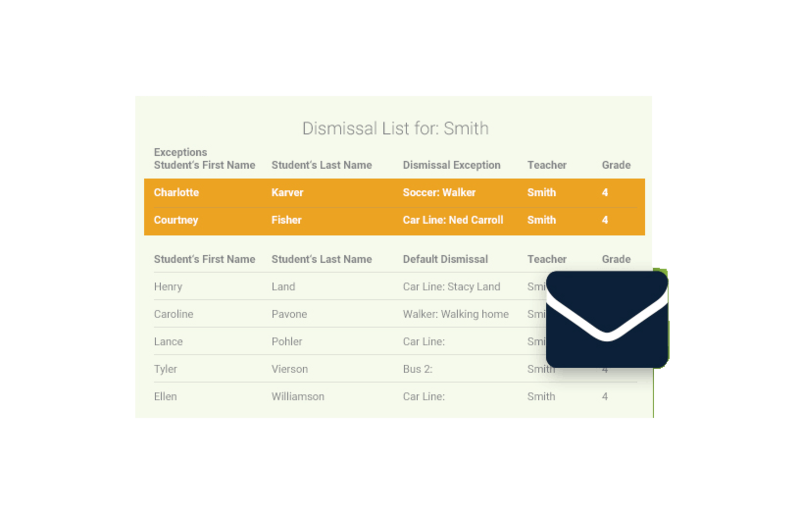 No more juggling notes, emails, calls and text messages to dismiss students. At the end of the day everyone knows who is going where and when. Teachers can teach and parents can take charge of dismissal instructions even late in the schoolday with a click or two. Since we began this movement over 10 years ago, we've designed SDM to be easy for you, your parents, and your teachers. Parents use phone apps to give dismissal instructions. Admins use screens that are simple and consistent. Teachers get an email report at the end of the schoolday. Everything runs on the web so no special hardware, tags, photo galleries, or software to install or maintain. 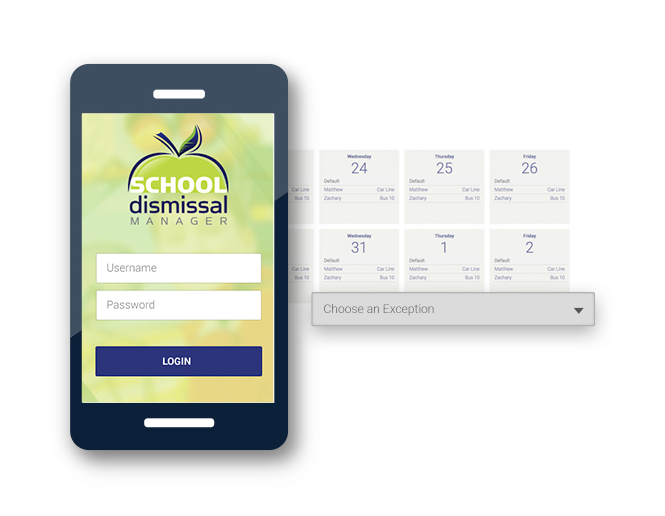 Simple phone app for Android and iPhone allow parents to specifiy dismissal instructions in seconds. They can make changes until the time limit you set. All changes are automatically sent in email reports to teachers at the end of the day. Email and app notifications go out to parents when changes are made. App users get a notification each morning with changes for that day. At the end of the day, teachers receive an email report that shows exactly where each student is expected for dismissal. Any questions? Show parents what they specified and when with the Parent History Report. Flexible FastLaneTM car line tools work with just about any school setting. Multiple buildings? Front-office check out? Car line zones? We handle it all. Students can be called from classrooms or from holding areas. FastLaneTM knows which children go in each car. We have schools that process over 350 cars a day with ease. Our support staff has experience setting up hundreds of schools and can help you get just the right fit for your school. We won't let you fail. Why wait? Now is the time to act! 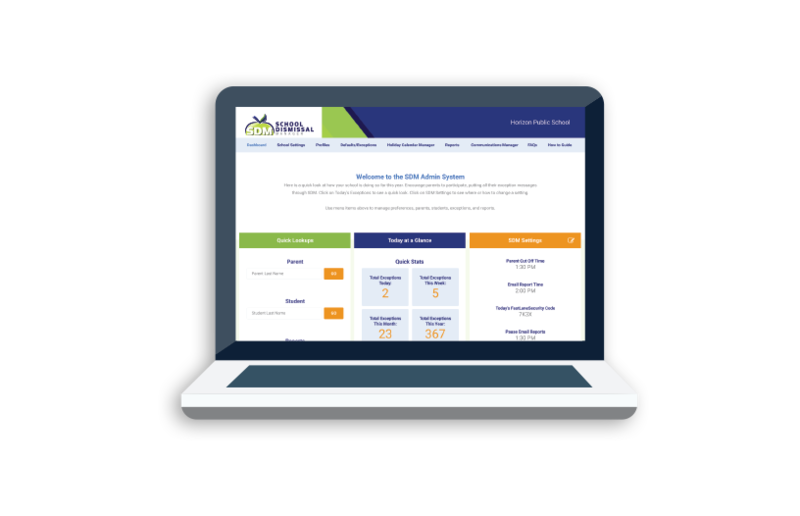 Click Here and let us take you step by step through the SDM experience.